With the number of devices and other things that ask for our attention constantly growing, the problem of distracted driving only seems to worsen. Many drivers in South Carolina are guilty of occasionally not paying attention while behind the wheel, which is a problem unto itself. However, when a commercial truck driver fails to pay attention to the road and causes an accident, the consequences can be all the more devastating. Operating a GPS. Semi drivers often have new routes to manage, and may be tempted to operate a navigation system while in motion, which is never a safe thing to do. Texting while driving. The temptation to send or receive texts is strong for many drivers. Texting and driving is illegal in most states for everyone, and truck drivers are specifically prohibited to do so by federal law. Talking on the phone or radio. Truck drivers are in regular communication with dispatch centers, customers, and other drivers via cell phone, or by radio, but when it takes attention from driving, the risk of an accident is greatly increased. Eating and drinking. Long hours behind the wheel and tight deadlines mean many are tempted to eat meals while driving. Drivers may take one hand from the wheel, or even attempt to steer a 40-ton truck at highway speeds with nothing but a knee. Reading or writing. 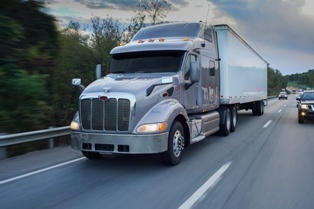 18 wheeler drivers frequently have a significant amount of paperwork to deal with, and the temptation to read over documents or even write and sign things while driving can be strong. There are countless other distractions that can lead to an 18 wheeler accident. For instance: facing and talking to a passenger, adjusting mirrors, or digging through personal belongings. Again, bear in mind that a semi-truck can weigh up to 80,000 pounds, while the average passenger vehicle weighs in around 3,500 pounds. When the 18 wheeler driver’s attention wanders, and he strikes that passenger vehicle at any speed, the sheer mismatch of force can cause life-altering injuries or loss of life in the blink of an eye. There are ways to prove the semi truck operator was driving while distracted at the time of the accident. The best place to gather evidence is often the scene, or from the vehicle itself. We work with a collision reconstructionist to analyze how the crash occurred, what could have been to prevent it, and whether the truck driver's actions point toward inattention. Likewise, an examination of the vehicle, its "black box," and the cab may provide clues on not only how the accident happened, but why. Cell phone and other electronic device records can similarly give us insight on whether the truck driver's full attention was on the road in the moments leading up to the collision. In some cases, there will be a witness who saw the driver not minding the road. And in other situations there will be video from traffic cameras or a nearby business with outdoor cameras that capture the crash, including the driver’s actions. An accident between a commercial truck and a passenger vehicle or pedestrian can be life-changing for the victims and their families. My law office has handled a number of semi truck accidents across South Carolina, and are here to help you in any way possible. These are serious cases, and it's important to have an attorney who understands the laws, regulations, and legal strategies unique to trucking cases. Our job is to help, all while treating you as a member of our own family. To begin receiving answers, and hopefully take some of the burden from your shoulders, contact us for a free consultation by telephone at (803) 790-2800, our contact page, or by clicking the live chat box on this page any time. We look forward to hearing from you.